As soon as the plane touched down in Allentown, I knew I was home. The tug of the land was profound as well as comforting. My ancestors on both sides of my family have lived in southeastern Pennsylvania for almost three hundred years. My maternal grandmother, Mary Price, was born in 1892 on the Price Homestead, which was first built by Jacob Price in 1720 after he purchased five hundred acres on the Indian Creek. Jacob Price was born in Wittgenstein, Germany and was a preacher in a religious movement called The Brethren (Church of the Brethren in the U.S.) The Brethren were persecuted by government authorities in Germany because they insisted on adult baptism by immersion and were pacifists. Hearing that the pacifist Quaker William Penn was a champion of religious freedom in the colony of Pennsylvania, Jacob Price and other Brethren sailed to America in 1719 and settled north of Philadelphia. Only in recent years have I realized how deep my roots are in the rolling farmland of southeastern Pennsylvania. My grandfather’s business, which eventually became my father’s, was located less than a mile from the home where my grandmother was born. Today my father lives in a Brethren retirement community not far from the Price Homestead. I grew up within miles of where my people first settled three centuries before. Home for just a few days, I walked, rode bike and drove miles along the familiar country roads of my childhood and youth. The Mennonite influence in this area (my paternal grandmother’s religious tradition) is pervasive, and I loaded up on traditional Pennsylvania Dutch foods. My father ran into a high school friend and neighbor in the Mennonite grocery store, and they began speaking Pennsylvania Dutch/German. My father lamented the fact that his native language will likely no longer be spoken after his generation dies. When I am home, I sense the presence of the “Quiet in the Land,” a term that describes the unassuming, hard-working, gentle and simple-living Mennonites but also applies to their spiritual cousins, the Brethren. The legacy of both sides of my family in the same area informs who I am today. Relishing every moment spent with my father, siblings and extended family, I felt completely “at home.” There was no other place I wanted to be. Playing golf with my father and brothers on a beautiful course in the country on a gorgeous summer day was a “thin place” where earth and heaven met, if only for that moment in time. “Coming home” to my family in Pennsylvania several weeks ago was very similar to the “homecoming” that took place in many of our churches yesterday. Every church I have served has tried to do something special on the Sunday after Labor Day. It’s traditionally the time when Sunday school starts, choirs return after the summer break and new ministries and programs begin. We welcome home all those who were gone for a good part of the summer, and it feels as if the family is back together. The energy is palpable. Almost every day I hear people give thanks for their church and refer to it as their spiritual “home.” Of course, just as with families, the church is not always a source of happiness, hope and healing. There are secrets in my family that no one wants to talk about. My paternal grandmother was divorced when my father was very young, and I still don’t know what happened. Neither does my father. In the same way churches sometimes harbor secrets or experience trauma, which can perpetuate dysfunction, inhibit healthy relationships and prevent the congregation from fulfilling its mission. At their best, however, both churches and families become “home” when they consciously exhibit these characteristics. Healthy churches and families are “home” when love is spoken. The world is filled with such harshness that our homes and churches need to be sanctuaries where our language is always one of humility, grace and unconditional love. The very name “sanctuary” implies a place of safety and refuge. In fact, from the fourth to the seventeenth century, English law recognized churches as places of sanctuary where fugitives were immune to arrest. When love is spoken, we remain connected with one another despite differences in belief and practice and learn to honor those differences as gifts of God. Healthy churches and families are “home” when all are welcome and included, no matter what. Many families and churches have one or more “black sheep,” members who stray from the fold. Remembering the words of the poet Robert Frost, “Home is the place where, when you have to go there, they have to take you in,” churches and families become home when they tolerate quirkiness and even tragic mistakes and never give up on their loved ones. Of course, support without accountability is never wise. That’s why healthy churches and families provide a safe place for members to admit their shortcomings and make positive life changes. One of the most important ministries of the church is to become home for people who do not have families that love, care for and value them. Regardless of their upbringing, all people are accepted as part of the family of God. Healthy churches and families are “home” when forgiveness is practiced. There comes a time in every church and family when “crucial conversations” need to take place. When betrayal, pain, inappropriate behavior or jealousy tear people apart, speaking the truth in love invites compassionate dialogue about difficult issues. Jesus gives us a clear process for such conversations in Matthew 18, known as The Rule of Christ. My own family has struggled with forgiveness and an unwillingness to let go of past hurts. Perhaps your family has as well. I pray continually for God’s grace to lead us to a safe place where we can ask for and receive forgiveness and relationships can be restored. In both church and family it is possible to redeem the past and make the future different. Healthy churches and families are “home” when we pull together in times of trouble. 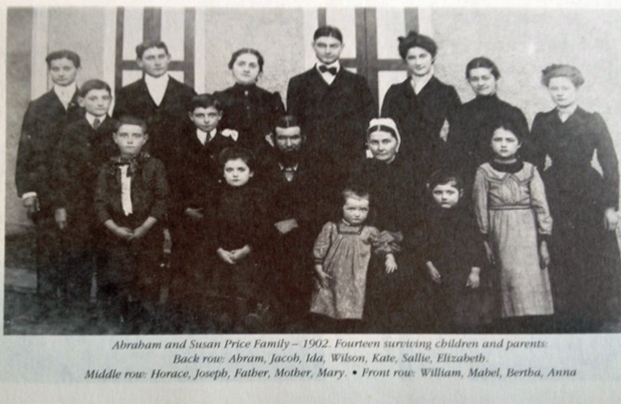 My great-grandfather, Abraham Price, and his wife, Susan Alderfer, were the last family to live on the Price Homestead. They had sixteen children, of which my maternal grandmother, Mary, was the twelfth (second row on the right, light-colored dress). In 1912 Abraham was kicked in the face by a horse and died in the barn before anyone could seek medical assistance. Everyone in the community pitched in to help the family with the farm. 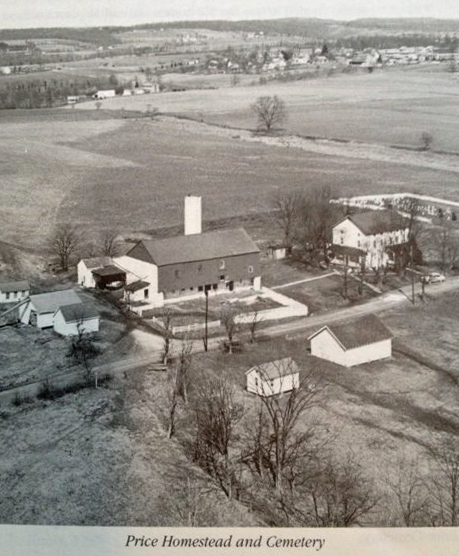 The Price Homestead was eventually sold in 1926 after having been in the family for more than two hundred years. Many times I have heard people say, “I don’t know how I would have made it without my church. They were there for me.” We become the church when we bear one another’s burdens not only within the church but within our families and communities as well. Healthy churches and families are “home” when we are encouraged to use our unique gifts and are challenged to grow in grace and truth. Is there any more beautiful sight than parents and church members encouraging their youth to become all that God created them to be? By quietly calling each other to unlock our human potential and become more than we dreamed, we empower each other to change the world. Is blood is thicker than water? This old saying has traditionally referred to the fact that family ties are always more important than the ties of friendship. We don’t get to choose our relatives, and we are not always as close to them as we are to our friends, but there is a familial bond that is strong and deep. But there’s another way to look at this proverb. I wonder if it could also be said that the covenant of blood (i.e. the blood that is shed for each other by soldiers on the battlefield) is thicker than the water of the womb. This interpretation implies that a decision or promise made by choice is thicker than one forced by biology. All I know is that family ties run deep, even when we are not always best friends with our relatives. At the same time I have found most of my best friends through the church. Covenantal friendships with fellow Christians add depth and meaning to our relationships. Our call as Christians is to create home for all of God’s children, whether in our families or the church. How can your family become “home” for all of your kin, not just those whom you like? How can your church become “home” for guests, members who have been estranged and for those who are not like you? How might every Sunday be an opportunity for others to come home to God? Wonderful piece on “Home,” Laurie.